The transmission of electrical power can be done overhead rather than underground using different types of transmission cables. These types of electrical power transmissions have their own benefits, pitfalls and also applications where it is frequently used. The selection of method mainly depends on the factors like cost, voltage, safety, application, etc. The overhead power transmission is cheap and the installation process is cheap. Whereas, underground power transmission is expensive and also has many advantages. The applications of this transmission mainly depend on the crowd areas as well as where the possibility of overhead power transmission is not possible. Sometimes, due to factors like physical, cost and environmental, the two types of cables are combined together for electrical power transmission This article discusses an overview of underground electric power transmission, types, installation, features and more. What is Underground Electric Transmission? The electric power transmission can be done using a method like undergrounding as an alternative to overhead power transmission. These cables have low visibility and not affected by bad -weather. But, the cost of these cables is high and laying process is time-consuming instead of overhead building. The finding of faults in underground transmission lines takes much time for repairing as well as locating. In urban areas, this type of transmission is enclosed with shielded with dielectric liquid and a metal pipe that is either fixed or spread through pumps. If an electric-fault breaks the underground pipe & generates a dielectric liquid into the nearby mud, then the liquid nitrogen trucks are assembled to fix the damaged part of the pipe location. This kind of transmission cable can extend the fixed period as well as the cost of repair. The stats of the pipe and soil are monitored frequently throughout the period of repair. At present, there are two types of underground power transmission cables which are assembled in a pipe and solid dielectric cable. The first type is circulated around the cable in order to control the heat as well as protect the cable. The second type of cable doesn’t require fluids, and it is the most current advancement in technology. The most common types of underground electric power transmission cables include the following. Generally, the step by step procedure of installing underground electric power transmission lines includes the following series of events. From the above installation, activities are performed concurrently so as to reduce the intrusion with road traffic. The main features of underground electric power transmission include the following. The construction of underground power cables is expensive and that have a safety against corrosion, moisture, mechanical injury and effect from the soil due to environmental impact. The construction of these cables in the underground is expensive compared with the overhead power cables because these cables are simple and don’t need any insulation as well as the shield. 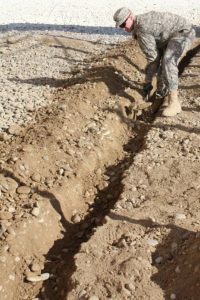 The installation process of underground electrical cables requires digging whereas, in overhead lines, it is located on poles. Due to some utility service lines, this may be complicated by another type of value services like pipelines of gas, oil, and sewer lines. Other problems may occur due to loose soil, rocks and water on roads will more expensive to fit. Dissipation of heat in underground power transmission cable is partial with insulation layers as well as protection like sheaths & armoring. Therefore, most of the heat is maintained near the cable. Compared to overhead cables, underground cables have a huge conductor with the same quantity of electrical power. As underground electrical power transmission cables have an artificial cooling system. The underground electric power transmission cables are limited by the costly construction and dissipation of heat. Due to these reasons, an underground cable transmits up to 33-kilovolts. It is complicated to recognize the faults in underground electric power transmission. Because it takes a lot of time to find as well as repair the underground cables. The underground electric power transmission cables are very safe to the environment, public, animals, etc. These cables are not impacted and affected by the conditions as well as trees, accidents, animals, storms, physical interference, the wind that may direct to damage the poles, cables, etc. The underground electric power transmission cables are not affected by the lightning expulsion. The underground electric power transmission cables have less voltage drop due to the truth that these cables are much larger in diameter than overhead cables for the same power delivery. These cables don’t interfere with close proximity communication lines TV, radio, corona discharge. The lifespan of underground electric power transmission cables has low compared to overhead cables. The underground electric power transmission cables more benefits of health, ecological due to noise reduction and superior plants management. Additionally, these cables have low loss of transmission, reduced harm, and accidents. The underground electric power transmission cable uses better land without the view of cables as well as poles, which leads to improving the values of the property. The advantages of underground transmission lines include the following. Less Damage from different weather conditions like winds, freezing, lightning, cyclones, etc. The range of EMF (electromagnetic field) emission will be reduced into the nearby area. The underground electric power transmission cable requires a small strip of about 1 to 10 meters for installing. These cables have less risk of theft and prohibited connections. The disadvantages of underground transmission lines include the following. 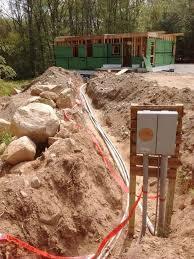 Undergrounding cables are very expensive. The repairing of these cables as well as finding faults can take many days. The locations of underground cables are not always noticeable, which can lead to damage the cables. Operation of these cables are very difficult due to the high reactive power of these cables generates high charging currents. Thus, this is all about underground electric power transmission. Underground cables are expensive to build as well as install. The applications of underground electric power transmission cables include urban areas where it is complex to install overhead power transmission cables due to obstruction and dangers presented by the overhead lines. It can enhance the primary transmission line cost of electric power as well as distribution however that may reduce operational charges over the lifespan of the cables. Here is a question for you, which transmission is better, underground or overhead?